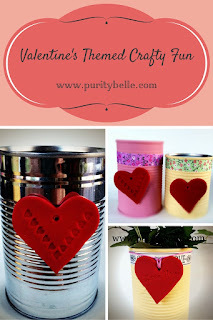 Valentine's Day Crafty Ideas, Upcyled Tins and more. I'm not a huge fan of Valentine's Day to tell the truth, it all seems a bit contrived. I'm also getting really tired of being bombarded with pressure to buy constantly - every single event now seems to be an opportunity for retailers to convince us that we need to splash out money on totally inessential decorations. Before I sound like a total killjoy, though, I must add that I do think it's lovely to celebrate occasions and I love an excuse to make pretty things and try out new ideas. So here are a few of my crafty ideas for Valentine's - they can be used as gifts or just to brighten up the home or to have fun with the kids. They can also be used as anytime crafts and adapted to your own tastes. First up are some painted tins - I always have chalk paint in the house. It's incredibly versatile and can be used in so many ways (see my Chalk Paint Projects post for some inspiration). I've been using the tins as part of my candle business but here they can be gift containers or plant pots or just use your imagination! The cleaning of the tins involves a little bit of work, the labels have to be removed and the tins washed with soapy water and thoroughly dried. There is usually glue residue on the tin, sometimes it can be easy to remove, other times a good bit of white spirit is needed. The beauty of chalk paint is that you don't need primer or any preparation really and coverage is excellent - I used two coats for these but you could get away with one if you were feeling lazy or wanted a more rustic look. The fun bit for me is decorating - I'm a bit obsessed with washi tape and have absolutely loads of it but you could use ribbon or stickers or anything you liked to decorate the tin. Because I was keeping to a 'love' theme, I used that in the tape and just left it simple. I used two tins as little planters (this is also good for an Easter theme) and left two empty. These I thought would be nice to hold little sweets or any other small gifts. (Note, the planter will need drainage so you should punch or drill a hole in the bottom of the tin if you pick this option). and I also got the magnet strip there too. The clay is brilliant, I've used it many times to make tags and it's so easy to use, just soften with your hands to make it more pliable and then roll it out and cut using a biscuit cutter or create a more freeform shape if you like. It then bakes in the oven on a low heat to harden it. I made hearts for my Valentine's theme and picked a red colour. I used a stamper on an acrylic block to stamp the words and the little heart stamper was one I got in Tiger some time ago. I used some of the tags just to decorate the planters (nice if they are for a gift) and I created some magnets too. This was simply done by using the magnet strip I got in Art & Hobby and cutting small squares which then stick on (it's self adhesive) - couldn't be simpler! You can see them here stuck on the tins, I think they look really cute. You can also just stick them on an unpainted tin for a quick project - can be a make up brush holder/pen holder/gift container or anything you like. I hope you like my ideas and I'd love to hear yours too. You can also check out my Flapjacks and Shortbread post if you'd like to make an edible gift like the biscuits below. You have the same ideas about Valentines Day as I do by the sounds of it! Some lovely stuff here though, and the biscuits look great! I share the same thoughts about valentines day, it's contrived, just a big money making scheme. I do love these though, they would make nice desk organisers! Chalk paint is good for so many things! Great ideas, definitely going to upcycle a tin for my makeup brushes! Great ideas and things that my teen would enjoy making. Thanks for the inspiration. I don't celebrate valentines day either but these are super cute! i LOVE making homemade things and have pinned this for later! Really like the upcycled tins idea - they look really good!